The Sri Lankan navy says that it has recovered more than a million steel ball bearings - used in claymore mines - after a skirmish at sea. 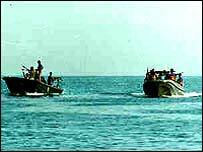 The navy says that two Tamil Tiger boats were destroyed in the clash off the north-west coast. A spokesman said he believed they had foiled an attempt by the rebels to smuggle the ball bearings into the country to be used in attacks. The rebels say the boats were not theirs but belonged to fishermen. Defence officials also say that the air force bombed suspected rebel targets in the northern Jaffna peninsula on Friday. A statement said that war planes struck targets in the towns of Sorampattu and Palai, destroying mortar positions. The pro-rebel Tamilnet website said that civilian settlements were hit in the air strikes. According to the navy, patrol crafts on Friday spotted two boats approaching the land. They challenged them and fired warning shots. When those on board the boats responded with small arms fire, the navy says its patrol sank them, killing at least four people. Divers sent to search the wreckage later recovered more than a million steel ball bearings in sacks, the navy says. Navy spokesman Lieutenant-Commander Rohan Joseph, said he believed they were being smuggled from India to Sri Lanka by the Tamil Tigers to be used in claymore mines. The BBC's Roland Buerk in Colombo says that claymores are planted above the ground and use an explosive charge to fire shrapnel horizontally. Our correspondent says that they have been frequently used in attacks blamed on the Tigers. For months, Sri Lanka has been sliding back towards war, despite a ceasefire still being in place on paper. It was signed five years ago next week, but is being ignored by both sides. Sri Lanka's government has driven the Tigers from much of the east of the country and has not ruled out taking military action against rebel strongholds in the north. On Thursday warplanes bombed Tiger maritime bases in Chenmalai along the northern coast of the island, the defence ministry said. 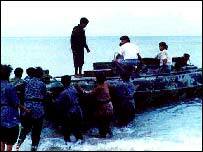 "The Sea Tiger bases were completely destroyed," it said.